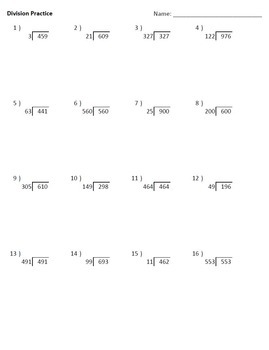 This Excel sheet is configured to generate custom long-division worksheets on demand. Simply supply the number or numbers of digits you would like to have in the dividends (the inner number) and divisors (the outer number), and print a new randomly generated worksheet and answer key. 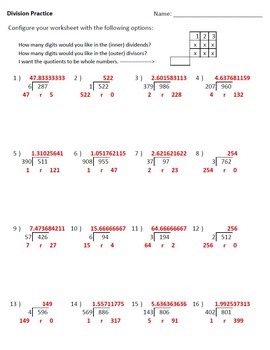 Also select whether or not you want to require quotients to be whole numbers. 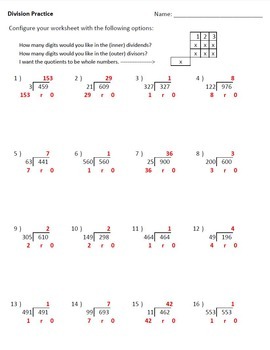 The answer key displays results in both decimals and remainders. Use this infinitely many times for your own selections of difficulty. Select the number of digits to include in the dividends and divisors by placing an "x" in the appropriate boxes. To generate a new worksheet with the same difficulty settings, simply double click inside any cell and hit the "enter" key. Save money when you buy this in the all-inclusive worksheet-generator bundle containing addition, subtraction, multiplication, and division worksheet generators all in one Excel file.